anne francis' earrings aside...what is up with that top she is wearing? Tee hee... thanks for sharing, Emily! Too fun. Ralston's hair is a little on the wild side, but that outfit is really cute. Ann-Margret's outfit is hideous. My brothers would give me no peace if I undertook to wear such a hat. The coat and dress are also on the scary side. The shoes are cute, though! Great pictures even though they were also kinda silly! Well every generation has their dirty laundry. lol. I'm sat in my college library and I must have looked like a mad woman when I was laughing at those pics. You should come to my miniture flat, I have Audrey Hepburn mania. Roman Holiday is a good film isn't it? HA HA HA HA! That's hilarious! I can sympathize with frizzy hair myself. 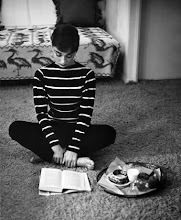 I like Audrey Hepburn, too (for her pretty clothes).